What was the 1939 Register? Why are there more transcription errors than usual? Who should we be looking for, and why? This is a Special Edition of the LostCousins newsletter; for other issues please visit the LostCousins website and click the 'Latest Newsletter' link in the menu. You can help LostCousins remain independent if you use the links in this and other newsletters when you visit genealogy websites. Sylvanus Percival Vivian, Registrar General for England &Wales between 1921-45, was the driving force behind the creating of the 1939 National Register. Having organised the 1921 and 1931 Censuses, and having written critically about the 1915 National Register he recognised that infrastructure for the 1941 Census could be used to create a National Register, should war break out. His preparations for the 1941 census were, therefore, intertwined up with the planning of a national registration system for the purposes of conscription, which began at least as early as 1935. However the National Register wasn't created simply as a means of identifying fit young men who could be sent abroad to die for their country - the Great War had demonstrated how important it was to effectively marshall resources on the Home Front. When the 1939 Register was released in November 2015 it could only be accessed using credits purchased at the Findmypast site - it was not included in any of the subscriptions. Now you can access the Register with any World subscription to Findmypast, with a 12 month Britain subscription (not available to new subscribers) or, following the introduction of a new subscription structure at Findmypast.co.uk in November 2017, with any Plus or Pro subscription - you'll find more details here. We're used to censuses that aspire to record everyone in the land - but that wasn't what happened in 1939, even though it was organised in a similar way. Note: it's rare to find a member of the armed forces on leave in the Register, but you'll find an example in one of the articles below. Other key differences compared to the censuses are that relationships are not shown, middle names are rarely shown in full, and places of birth are not listed. However, precise dates of birth are given, and this information might well save us the cost of buying a birth certificate, especially for our more distant relatives. Tip: birthdates are not always recorded correctly - I have two great-aunts who were twins, but if you relied on what the enumerators wrote down (they were different enumerators because both of the sisters had married before 1939) you would think they had been born a month apart. I've no idea whether the mistake was made by the husband or the enumerator - but it certainly wasn't the transcriber. 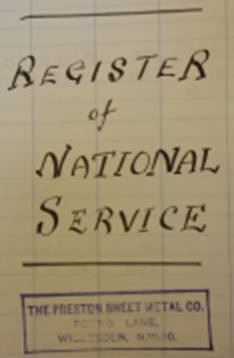 The 1939 Register was a working document - unlike censuses, which were checked, analysed, and then archived, the National Register was updated as changes occurred. For example, if a woman married she would normally adopt her husband's surname - and if this occurred after 29th September 1939 a new identity card had to be issued. 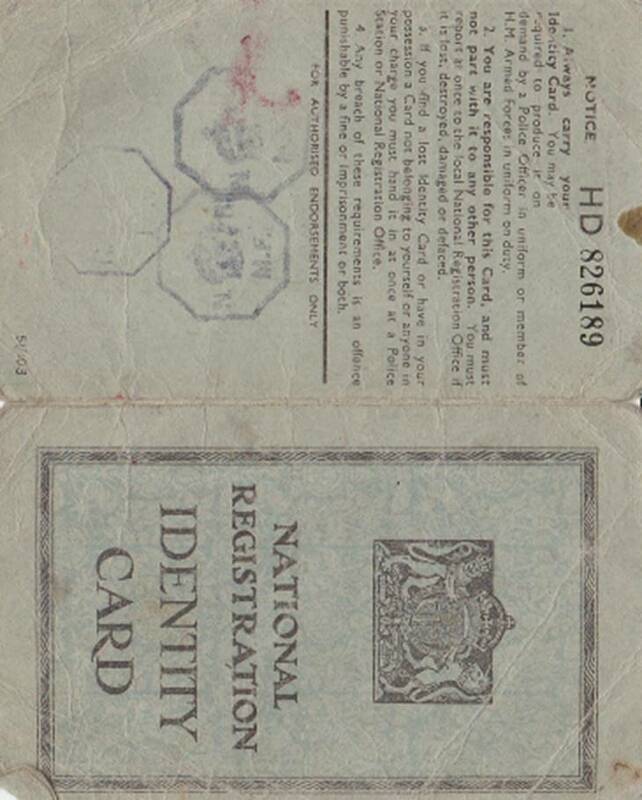 Tip: the use of identity cards didn't end when the war was over - they continued in use until 1952. When the National Health Service was founded in 1948 the National Register was used as the basis of the NHS Central Register, and this continued in to the early 1990s. As a result many name changes were recorded as the result of marriages (and divorces) that took place in the 1950s, 1960s, and 1970s. There may even be some later changes - but I haven't seen any yet. This tells us that May E Lawson became Dalrymple on her first marriage (which was in 1951), and Noon on her second marriage in 1955. She died in 1985, but the record would be open in any case as she was born in 1904, which is more than 100 years ago. Changes weren't made immediately - there was usually a delay - and in the example above you can see the change of name to Dalrymple seems not to have been recorded until early 1955, by which time Mrs Dalrymple (nee Lawson) was well on her way to marrying again - she married Frederick E Noon in the third quarter of that year. This means that where a date is shown all you can conclude is that the event must have happened prior to that date. You are NOT seeing the date on which the person married or divorced. Tip: information in the same colour ink and handwriting is likely to have been entered at the same time - without this clue I might have associated the 1955 date with the second marriage. That's my mum! 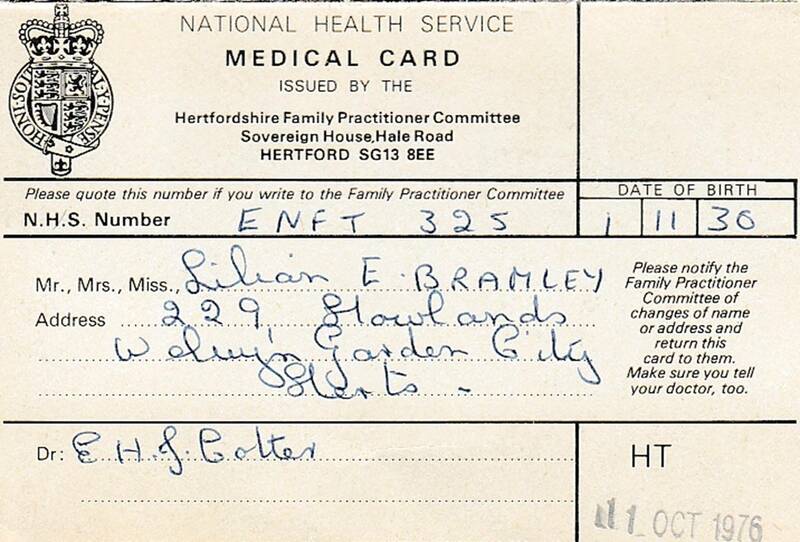 Note that the original surname - the maiden surname in this case - is shown in parentheses. Her family didn't live in Suffolk - but my mother's school was evacuated from Ilford in Essex to Ipswich. I'd probably never have known about this had it not been for the 1939 Register. If you're used to just typing in names and seeing results pop-up you might be frustrated by the number of transcription errors. Fortunately it's unlikely that they'll prevent you finding the right records because there are so many different ways of searching - and anyway, most transcription errors can be overcome by the judicious use of wildcards. But it's important to understand just why there are more errors than usual. First of all, there was a war on - the enumerators don't seem to have been as careful with their handwriting as one would have liked. The fact that they were using fountain pens probably didn't help - there tends to be too much ink, so that some of the details disappears into a blob. And the transcribers also had to decipher entries that had been crossed through. However, the biggest challenge for the transcribers was the result of privacy concerns - these records were not due to be opened until 2040, by which time everyone recorded would have been over 100 years old. This is why we could initially only see records for people who were born over 100 years ago, or whose death had been recorded in the register (some other records have since been opened up for people who are known to have died). 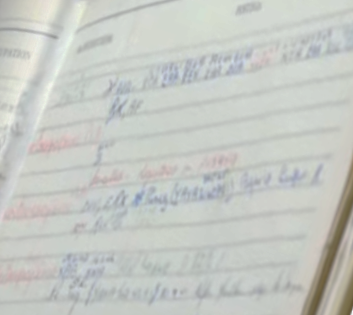 This meant that the transcribers weren't given an entire page to work with - instead the page was divided into columns of data, and these were given to different transcribers, none of whom could see the entire entry for any individual, making it much more difficult for them to interpret the handwriting. This ingenious process also generated errors even when the transcribers got it right - on some pages the columns of the transcription were 'out of sync' when the page was reassembled, so that part of one record was combined with part of the next record. Such errors look ludicrous to us, seeing complete entries, but the transcribers of that page might not have done anything wrong. I'm never one to criticise transcribers because it's not a job I would want to do, even though (and, perhaps, because) I'd be very good at it - but in this instance the challenges were greater than usual, and we have to remember that what we see isn't what they saw. Because in most cases the enumerator only wrote down the last two digits of the birth year it was relatively easy for years to migrate from one century to another. Note: when you able to consult the original record the transcription acts only as a finding guide; this means that errors in a transcribed record, no matter how ridiculous they seem, are generally of relatively little consequence. 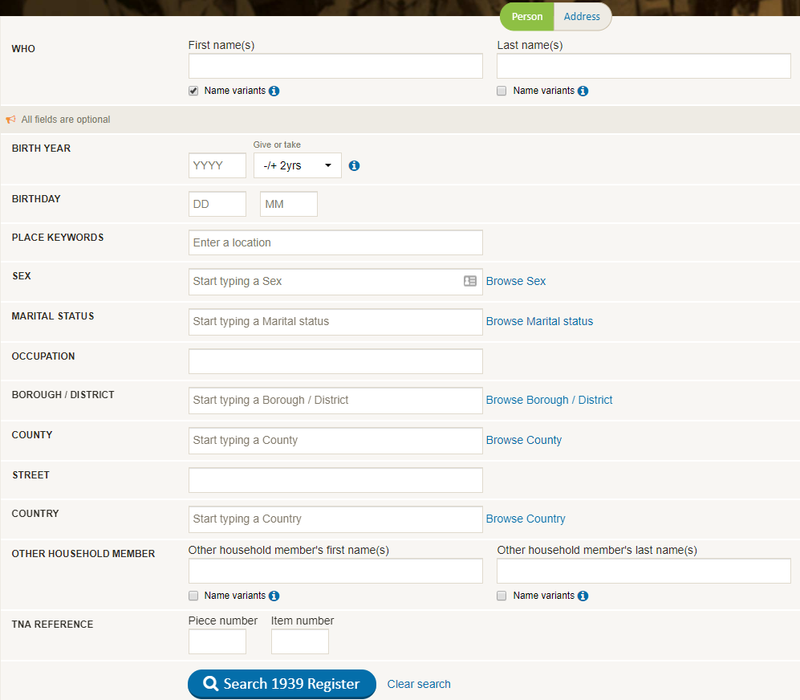 As you can see, the Person Search page looks quite similar to the page we see when we search the 1911 Census at Findmypast, but with the addition of the Birthday field. All of the fields are optional, even the name - so you can start with a very broad search and narrow down by adding more information. Tip: less is more when it comes to searching at Findmypast - the less information you enter on the Search form, the more results you'll get! Should you get too many results you can always add more information and try again. Note that there are boxes on the form for the National Archives references - the piece number, and the item number. I suggest you record these for the households you purchase as they'll provide a quick way of finding the record again. And who knows, perhaps one day we'll add the 1939 Register to the list of censuses supported by LostCousins? I suspect that the Address search will be used mainly by people who want to find out who was living in 'their' house in 1939, or who want to find out information about their neighbours - I looked at the house where I grew up - most of the neighbours are well over 100 by now (some of them seemed like it at the time, though most of them were younger than I am now!). But the Address search it will also come in handy if you have trouble finding someone using the Person search, either because their name has been mistranscribed or because they were using an assumed name (like one of my cousins, who had left her husband and in September 1939 was 'living in sin' with the man she married after the war). For more information about searching please check out this article on the Findmypast blog (you don't need to be a Findmypast subscriber). Postal addresses can be a misleading guide to the Borough/District - for example, I grew up in Chadwell Heath, Romford as far as the postman was concerned but we were in the adjoining borough of Ilford for the purposes of voting and rates. I didn't find this out until very recently (since when we lived there I was far too young to vote). There might be more than one street in a borough with the same name - this is most likely to be a problem with common names like Station Road, or London Road. Some address information was omitted when the records first launched in November 2015, and whilst this has been addressed (pun intended) the problem might persist in a few instances. When you search for a street you can view a list of all the houses that have been indexed - even if there is a gap in the numbering it's likely that the occupants of those properties can still be found by name. Streets may have been renumbered or renamed. Locked households are households you haven't viewed before; unlocking a household allows you to see the open records in that household. If you have a Findmypast subscription which includes the 1939 Register then you can unlock as many households as you want - whether a household is locked or not is more relevant if you are using credits to access the Register, or if your subscription has expired. Closed records exist in both locked and unlocked households - they are records that you can't see because the person is recorded as having been born less than 100 years ago, and their death has not been confirmed. Closed records can usually be opened by submitting a death certificate, but you need to know where the individual was living in 1939. If a record is closed then you won't find that person in the index, no matter how you search. For example, when the register first launched my mother was not in the index, and because she had been evacuated I didn't know where she was living. Fortunately Findmypast opened an additional 2.5 million records in December 2015, having used a sophisticated algorithm to match death index entries against register entries - this was possible because the death indexes from 1969 onwards include the individual's date of birth. Millions more records have been opened subsequently. There are still many records which are closed, even though the person is now deceased - unfortunately the National Archives, who hold the registers, and have ultimate responsibility for deciding which records can be opened, have to take a conservative approach to avoid breaching the privacy of living people. However if you can work out where someone was living, and have their death certificate, you can open the record. When you view the handwritten images you see an entire page - other than the closed records, which are blanked out. Usually the inhabitants of a household are listed in the same way that they would be on a census, starting the father and continuing with the mother and the children in descending order of age; lodgers and visitors are likely to be at the end. You won't always be able to see where one household ends and the next begins, but you can easily work it out from the way in which the entries are numbered. Remember, you know how many open and how many closed records there are in a household from the transcription (it isn’t always obvious from the image of the register page). This means that in most cases you'll be able to work out whose records are hidden, by combining what you can see or deduce with your own knowledge of the family. Tip: in a few cases you might see a small part of a closed record - perhaps the descender from a letter 'y', 'g', 'p', or 'j'. The position of the descender may help to confirm that the hidden person was named 'Mary', or 'George'. Often the most interesting revelations are going to come from researching people who aren't close relatives. For example, as mentioned above, I discovered one of my Dad's cousins living with a man who wasn't her husband, and that solved several mysteries for me. It also indirectly enabled me to identify several cousins who are still living - so much from just one household! I also found it interesting looking at neighbours, some of whom I remembered from my childhood in the 1950s - and I discovered a lot that I hadn't known about a family friend who my mother had worked with during the War. How much you learn will depend not so much on how much you already know, but on how open you are to making new discoveries - indeed, the more you know, the easier it will be to expand your search outwards, to more distant relatives. What you find in the register won't be an end in itself, but a gateway to yet more information - once you know precisely when someone was born it's usually easy to find their death (assuming they died between Q3 1969 and 2007), and that makes it easier to fill in the gaps in between. The rather fuzzy photo on the right is the only known image of the opposite page of a register - we normally only see the left-hand page and the first column of the right-hand page. I grabbed this shot from a video on the Findmypast blog, and whilst it’s hard to make out any of the detail you can get an impression of the sort of notation you might find (given the opportunity). Fortunately we're probably not missing out on very much by not seeing that right-hand page - frustrating as it is not to be able to see it! This isn't, of course, the Identity Card she was issued in 1939 - it has her married name, and her new address, But the number of the card is exactly the same, because that's how the system worked. If you go back to the 1939 Register entry you'll see that it shows the date in 1950 that the register was updated, probably 1/3/1950, and also a three letter code AFG, which also appears on the Identity Card. This is the three letter for Deptford, the borough to which she had moved. In the second part of this article - which follows - I'll be looking at another example of how Identity Card numbers were used, both during and after the war. In the previous article I described how the numbers on identity cards came about, and explained that - whilst the numbers were originally based on a person's whereabouts in September 1939 - they didn't change when someone moved house, or even when a woman acquired a new surname as a result of her marriage. Indeed, because - in England, at least - the same numbers were used for NHS cards even after identity cards were abolished at the end of 1951 some people kept their numbers for half a century. 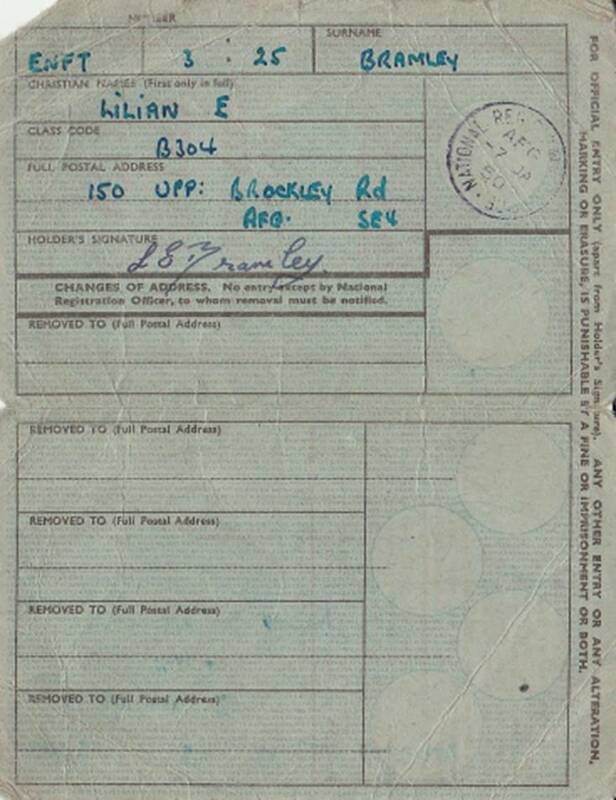 Now I'm going to show how identity card numbers - references from the 1939 Register - were used by employers during World War 2, focusing on The Preston Sheet Metal Co. in Willesden, north west London. In the process I'll provide some examples from the company's own records, and then show the corresponding entries in the 1939 Register. Note that whist the address is different, the Letter Code, Schedule, and Schedule Sub Number (BXAE/116/1) match the information given in the company's records. And we now know what sort of products the company was producing - panels for aircraft. Intriguingly there's a closed entry in the register immediately below the entry for Leslie Foskett, although the transcription doesn't mention that there are any closed records in the household. A search of the GRO marriage registers showed that in the second quarter of 1939 Leslie R Foskett married Phyllis J Payne, and since there was someone of that name whose birth was registered in Willesden in 1918, I suspect that the closed record relates to her. Going back to the records of The Preston Sheet Metal Co. you'll notice that there is a column headed 'Registration Number', and that the reference shown for Leslie Foskett is WPF 10097. Looking at the other entries I noticed that these references only appear when there is an entry in the 'Labour Exchange' column, so I suspect that they have nothing to do with the 1939 Register or identity cards, but might indicate an employee who was sourced from the relevant exchange (these establishments still survive, but we now call them 'Job Centres'). Most of the entries attributed to the St Mary's Rd exchange are prefixed WPF, though a few have the prefix EXX, and I spotted one HFL - perhaps someone reading this article will be able to interpret these references? But coming up to London did have its benefits - in 1946 Edna married Frank H Lowe. Edna died in 1971, just as they would have been celebrating their Silver Wedding. This is a rare example of a serving soldier recorded in the 1939 Register - I imagine he was home on leave. Frank Hector Lowe junior lived until 2003, and died in Hackney registration district, not far from where he was living in 1939 or from where Edna died in 1971. Tip: you will find a list of reserved occupations on Guy Etchells' website here. Whilst you can't enter people from the 1939 Register on your My Ancestors page (at least, not at the moment), many of them will also have been recorded on the 1911 Census. I've therefore created a new category in the Relationship or category dropdown menu - WW2 evacuation - so that I and other members can search for relatives of the people who looked after the evacuees in our families during the war. I'll let you know if I get a match! In the meantime, why not see who you can find? If your family comes from England or Wales, and you have either a Findmypast.co.uk or Ancestry.co.uk subscription, you'll not only have access to fully transcribed GRO birth, marriage, and death indexes but also to the complete England & Wales 1911 Census. By combining these two resources you'll probably find that you can add dozens of new relatives to your family tree - without spending a penny on certificates! (1) Where there are married couples on the 1911 Census and the wife is of child-bearing age (typically up to 47) I search the birth indexes for children born to the couple using the family surname and mother's maiden name. The rarer the surnames the more confident I can be about identifying the entries, especially if I also take into account the choice of forenames, the timing of the births, and the districts where the births were registered. Tip: even if the surnames aren't particularly rare, the surname combination might be - a search for marriages where the bride and groom have the same surnames will help you gauge how likely it is that the births you've found belong to your couple. (2) I then check to see whether I can identify marriages involving relatives who were single in 1911. This is generally only possible when the surnames are fairly uncommon (but see below). (3) Having identified these post-1911 marriages, or possible marriages, I look in the birth indexes for children born to the couple using the technique described in (1) above. Sometimes the choice of forenames will help to confirm whether or not I've found the right marriage. (4) I next look for the deaths of the couples whose children I've been seeking. If the precise date of birth is included in the death indexes, as it is for later entries, this often helps to confirm not only that I've found the right death entry, but also - in the case of a female relative - that I've found the right marriage. Even if I don't know exactly when my relative was born, the quarter in which the birth was registered defines a 19 week window (remember that births can be registered up to 6 weeks after the event). Why does this work best for female relatives? Because they will have changed their surname on marriage, so their birth will be registered in one name and the death in another - and there will be a marriage that links the two. Tip: probate calendars can also provide useful clues - often one of the children, or the surviving spouse, will be named as executor or administrator. You can search the calendars from 1858-1966 and 1973-95 at Ancestry, or from 1858-1959 at Findmypast; if you don't have access to either of these sites, or want to search for more recent wills, you'll need to use the free Probate Service. (5) Now I start on the next generation, the children who were recorded in 1911 or whose births I have been able to identify as belonging to my tree. I look for both marriages and deaths, because if I find the death of a female relative recorded under her maiden name, this usually indicates that she didn't marry, and even for a male relative the place of death might help to determine whether a marriage I've found in an unexpected part of the country. (6) Having identified marriages I then look in the birth indexes for children born to those marriages - and continue this process until either I reach the present day, or I get to a point where I can't tell with reasonable certainty which entries relate to my relatives. Mind you, when it comes to more recent generations there are all sorts of additional sources of information - including social networking sites, Google, searches of the electoral roll (see the next article) or even the phone book (not everyone is ex-directory). During the 20th century middle names are more consistent than they were in the 19th century - there is less of a tendency for them to appear or disappear between birth, marriage, and death. Unfortunately, for more than half a century after 1910 only the first forename was shown in full in the birth and death indexes, and the marriage indexes only show one forename for the whole period after 1910 - so a perfect match on the second forename is only possible if the relative was born before 1911 and died after March 1969. What can you hope to achieve by following the techniques I've described? In my case I was able to extend some lines forward by as many as four generations, although three is more typical. In the process I added hundreds of 20th century relatives to my family tree, the majority of whom were still living. Since the 1939 Register was released I've been able to extend my tree further by confirming that many of the marriages I'd noted as possible marriages did indeed involve my relatives (the fact that precise birthdates are given is a really big help). One of the best things about the 1939 Register is the way that it continued to be used after the War - and so the surnames of many women were updated to reflect marriages (and divorces) that took place in the 1940s, 1950s, 1960s or even later. This makes the 1939 Register more useful than a static census, and since it was released I've added dozens more relatives to my tree, most of whom must still be living. Note: there will often be other resources that you can draw upon, including parish registers (some online collections extended beyond 1911), newspaper announcements (iannounce is good for recent events, the British Newspaper Archive - also at Findmypast - for early 20th century events). Burials recorded at Deceased Online are another great source (for example, there may be other family members in the same grave). Historic Phone Directories up to 1984 are online at Ancestry. Ancestry and Findmypast each have historic Electoral Rolls - Findmypast covers much of the country, but Ancestry is best for London. I was fortunate to find a document online at the HistPop website which details which areas came into which category, and I suspect many of you will find it very interesting to look up the areas where your family lived. It's about 12 pages long - use the Previous Page and Next Page links at the bottom to navigate; my understanding is that areas not specifically mentioned were Reception areas. Of course, trying to predict which parts of the country would be safe from the Luftwaffe wasn't a precise science - one member wrote to tell me that his family moved "out of the frying pan into the fire" when they relocated! "proceeding immediately with certain of the preparations for the 1941 Census, as a means of providing for the institution of a National Register at very short notice, should a national emergency arise." When you've seen as many pages from the National Register as I have, you'll know that the enumerators didn't always live up to those high standards - even handwriting that appears neat can be hard to read if the letters are written inconsistently, or confusingly. The fact that subsequent amendments to surnames were made in block capitals suggests that even at the time the handwriting was causing problems. With the threat of war looming, the British Government prepared plans for mass evacuation. During WW1 Germany had bombed London and other targets using Zeppelin airships (you can read more about it here), but now the enemy had modern bombers (over 1000 were operational by September 1939), and the bombing of Guernica in 1937, during the Spanish Civil War, had demonstrated the devastation that could be wrought. Preparations started long before the war: this form headed Government Evacuation Scheme is dated May 1939 - note that mothers were asked if they wanted to go with their children. "I have to tell you now that no such undertaking has been received, and that consequently this country is at war with Germany." Children had assembled in school playgrounds on the morning of 1st September, each with a luggage tag attached to their coat, and carrying bare necessities: their gas mask, underwear, pyjamas or nightdress, plimsolls, toothbrush, comb, soap, and a face flannel. Over half a million children were evacuated from London alone during September, and my mother - then 13 years old - appears to have been one of them, because on Registration Day (29th September) she wasn't at home with my grandparents. Over the course of just three days around 1.5 million mothers and children were sent from towns and cities into the countryside, mostly by train - you might this Southern Railways poster interesting. However, because bombing raids on cities didn't materialise in the first few months of the war, many children went back home - over half had returned by January 1940, despite Government warnings (I believe my mother was one of them). There were further waves of evacuation during 1940, and my mother's school was evacuated toFinnamore Wood Camp, Marlow, Buckinghamshire on 22nd April - you can see a photo here which shows some of the schoolgirls. My mother wasn't amongst them, however - my grandmother wouldn't allow her to leave home again - and so my mother left school and spent the duration supporting the war effort, working at the nearby Ship Carbon factory, which made carbon rods for cinema projectors and searchlights. A smaller number of children were evacuated overseas, a story told in the book Out of Harm's Way, written by an evacuee - but this programme came to end when the SS City of Benares was sunk in September 1940, killing most of the children on board. However some children were evacuated privately even after this incident. In 1939 the country was divided into more than 1400 administrative areas, each of which was assigned a three letter code, such as CJL for Bromley in Kent and ZDJ for Portmadoc in Caernarvonshire (larger areas may have had more than one code, in which case the code in the table is the first in the block). When you find one of your relatives you'll see that a fourth letter has been appended to the end - this specifies the enumeration district. You will find a table of codes and areas here and a more comprehensive list here. More codes were added after 1939. When, in February 2007, I asked to inspect the 1939 Register under the Freedom of Information Act I was rebuffed by the Office for National Statistics - it's covered by the 1920 Census Act, they claimed. Absolute rubbish, but for a while they got away with it, whilst I went through the appeals process. Then I got a phone call from the Information Commissioner's Office to tell me that whilst they were minded to allow my appeal, the records had been transferred from the ONS to the NHS, so the whole process would have to start again! Unfortunately by this time my father, who was in his 90s, was becoming frail and I was having to look at care homes - I just couldn't spare the time to do it all again. But fortunately I wasn't the only one trying to get access to the Register, and eventually, thanks to the efforts of Guy Etchells and others, it was agreed to provide information from the Register, subject to a fee of £42 per household (which wasn't refundable under any circumstances). Not a cheap option, but it was better than waiting until 2040 as the ONS had insisted when I first contact them! Then, in March 2014, came the moment that family historians had been waiting for - Findmypast announced that they had signed a deal with the National Archives which would see the register becoming available online within 2 years. 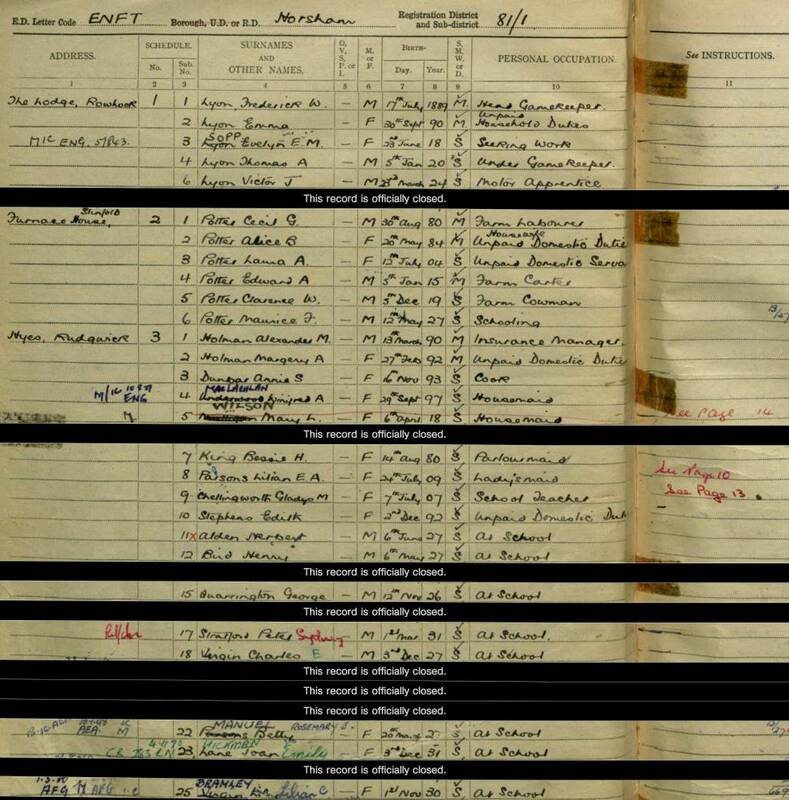 · My aunt's year of birth was erroneously transcribed (by the enumerator) as '76' rather than '16' which meant her record was open when it should have been closed - were she still with us she would have been absolutely delighted!